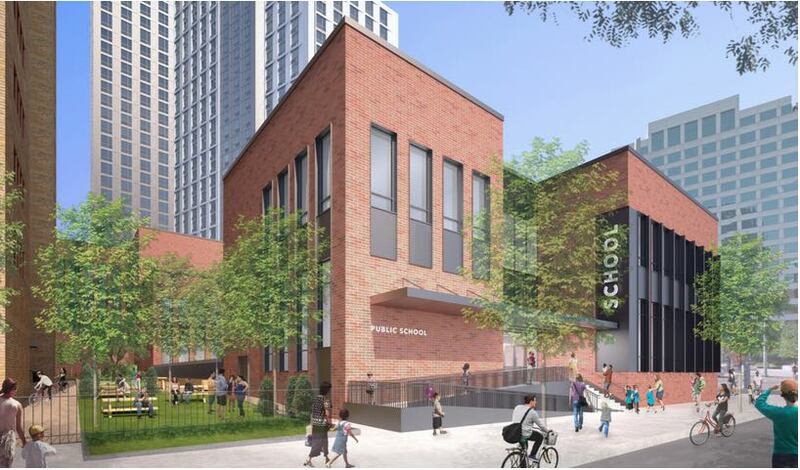 JERSEY CITY – Mayor Steven M. Fulop, in collaboration with the Jersey City Public Schools and the Jersey City Redevelopment Agency, unveiled plans yesterday for the state’s first public school located in private, residential high-rise housing to be built as part of a $370 million housing development on Christopher Columbus Drive. The project will feature a two story, 35,000 square foot public school accommodating 200 Pre-K, kindergarten, and first grade students, addressing the growing demand on the public school system. Finding innovative ways to bring public school classrooms without relying only on state subsidies has been a goal Mayor Fulop first proposed as a councilman and later as part of his platform while running for mayor. This will be the second public educational facility constructed with private dollars and the fourth school to commence construction overall since 2013. The redevelopment project, located at 25 Christopher Columbus Drive in downtown Jersey City, will convert an existing, underutilized parking lot into new mixed-income housing and will include both a 200- seat public school and open, green space. As part of the project, the redeveloper and the ownership of the adjacent 308-unit Paulus Hook Tower Apartments at 100 Montgomery Street have agreed to extend the term of affordability there – set to expire in 2020 – for another 20 years. The proposal was developed in coordination with the Jersey City Redevelopment Agency (JCRA) and the Division of City Planning to correct 1970s-era planning that led to disparate, disconnected city blocks. The new site will be more accessible, more public, and more consistent with ongoing redevelopment in the City’s downtown. “We’re delighted that the Mayor’s Office has facilitated this public/private partnership that will provide a high quality education in a state-of-the-art facility for the young families in Jersey City,” said Dr. Marcia Lyles, Superintendent of the Jersey City Public Schools. The Jersey City Board of Education was presented with the proposal at their Aug. 25th meeting and they voted unanimously to support the construction. As part of the project, the JCRA and Planning Board will both consider this week adoption of redevelopment plan amendments to rezone the existing parking lot to allow for residential, retail and community facility uses. The rezoning would allow for up to 750 new apartments, the construction of a new public school, maintenance of the current affordable units located at 100 Montgomery Street, and 37 apartments to be set aside as affordable housing for low-to moderate families and individuals earning no more than 80 percent of Area Median Income (AMI). “We look forward to embarking on this project with the support of Mayor Fulop and to providing much- needed school seats and mixed-income housing that is responsive to the needs of this growing community,” said Jonathan Cortell, Vice President of Development, L+M Development Partners.